Good cop – better cop? I didn’t set out to write a classic ‘cop duo’ story. Mind you – I didn’t set out to write a police procedural either – whoops! My first book, ‘Can Anybody Help Me?’ looked at the relationships between women on an internet parenting forum, and my original idea was to have the central character, a young woman called Yvonne, solve the mystery herself. But Yvonne was a new mother and quite a shy person, living in a new country and feeling, at times, totally overwhelmed. It wouldn’t have made sense to have her leap away from the computer, Nancy Drew style and start solving crimes. So, I needed a copper. And to keep things simple for myself – write what you know, eh? – I made her a woman. A pregnant woman, at that, who ended up falling into the internet parenting world herself. Even at that stage, however, Claire was a background character, a means to an end, until my lovely and very astute agent read an early draft of the book and asked if she could she brought more centre stage. My agent, of course had her eye on a sequel – see what I mean by astute? – but she also saw something in Claire that I hadn’t fully recognised. A spark, something different. That indefinable thing that editors and agents look for and writers often don’t realise they have created at all. So, I wrote more about Claire, and found myself warming to her. She’s a fascinating character to work with, not always likeable, but that’s part of the fun! Meanwhile, as I was writing her opening chapter, Philip Flynn walked into the room, completely unannounced. There was no need for him to be there at all. Claire was sitting in her office, moaning about feeling fat and hungry and all that needed to happen was that somebody had to give her a piece of information. It could have come via phone call or email, the method of passing it on was no big deal. But as I scribbled away in my usual ‘first draft’ style – throwing ideas down on the page in the hope that they would make sense later – in walked Philip Flynn to deliver the information in person. Philip, never Phil, a young ambitious guard with a neat haircut and an overly formal manner. When I looked up I realised I had written two paragraphs about this man who didn’t really have a part in my story at all. But I liked him, and he stayed. So there I was, with a police procedural on my hands and two police characters who seemed, on the surface, to be like a thousand other police duos. One male, one female. One junior, one senior. One determined to play everything by the book, the other fully prepared to ‘go rogue’ to get what she wanted. But that’s where it got interesting, for me anyway. What SHE wanted. It was Claire who was the older, more experienced cop, and it was she who was prepared to do whatever it took to solve the crime. Even if that meant going against medical advice. Flynn meanwhile stuck to the rules, and concentrated on what he thought of as ‘real policing’. The questions and the answers, the door to door stuff. None of that internet malarkey. As a duo, they made sense. Huge thanks to Sinéad Crowley for taking over the reins of the CTG blog today and telling us all about writing a duo. 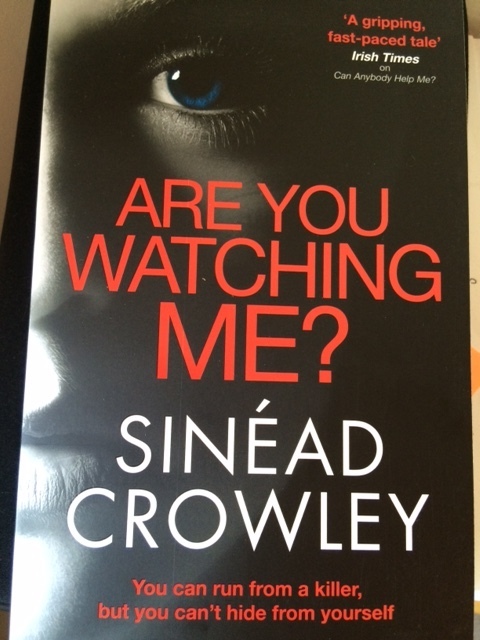 Her fabulous second novel – ARE YOU WATCHING ME? – is out this week. Great post – thanks Sinead and CTG!